Do you hear that? That’s the sound of the Grand Theft Auto V hype machine finally kicking into high gear. A relative deluge of recent press material has kept fans busy analyzing new screenshots, their excitement further stoked by confirmation of the game’s Spring 2013 release date. After weeks of buildup all its own, the second official trailer for Grand Theft Auto V has been released, and it promises a game every bit as expansive, and time-consuming as other entries in the franchise. You have to give credit to Rockstar: they know how to play things close to the vest. Coming out more than a year after the public first laid eyes on GTAV, the newest trailer hints at a few of the major changes in store for the first numerical Grand Theft Auto game since 2008’s wildly successful fourth installment. The story’s uncharacteristically deep bench of protagonists takes center stage, with stars Michael, Trevor, and Franklin getting some of their backstories filled in, in between shots of exploding train wrecks, bank robberies, and helicopters getting scrapped by a player-controlled fighter jet. Of course, the big draw is getting a glimpse at all the activities, legal and illicit, that Los Santos has to offer, but the trailer is a good reminder of the strong narrative suction at Rockstar’s disposal. Whipping along to Stevie Wonder’s “Skeletons,” the footage mixes in plenty of gallows humor to go with the destructive spectacle, setting a tone that’s more in a line with a caper-romp than another crime epic. The trinity of playable characters cover the usual roster of Rockstar leads, with Michael taking over Niko Bellic’s role as the ex-criminal who can’t get out of the life, though with the added familial baggage John Marston carried with him in Red Dead Redemption. Reserved Franklin, and wild card Trevor round out the cast, and the trailer’s highpoint is seeing the new faces of the franchise all come together. The in-game footage doesn’t directly showcase much in the way of gameplay, beyond the usual GTA fare of driving and shooting, but the world certainly looks as big as it is beautiful. Rottweilers have joined the local fauna, and, yes, you’ll be able to parachute out of an airdropped Jeep, should you please. One has to imagine this is just the first taste of a veritable marketing blitzkrieg that will intensify as we near the game’s Spring 2013 release. 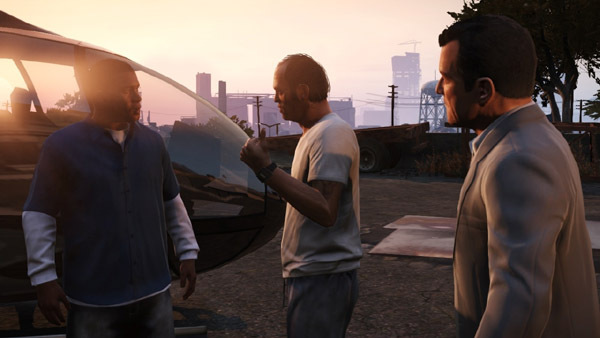 Take a look below at the second trailer for Grand Theft Auto V, and let us know what you think.